David Dornfeld, Department Chair of Mechanical Engineering, is a professor and Director of the Laboratory for Manufacturing and Sustainability (LMAS) at UC Berkeley. In 2013, he was named to the National Academy of Engineering for his work in manufacturing and sustainability. He leads research activities in several fields of manufacturing engineering – monitoring & analysis of manufacturing processes, precision manufacturing, green & sustainable manufacturing, and intelligent sensors and signal processing for process monitoring and optimization. Dave is also a fellow of ASME, SME, and CIRP. Dave provided some background of Mechanical Engineering at UC Berkeley with a brief history of LMAS. There are a range of projects examined in the lab including: ways to improve manufacturing technologies, analytical and assessment tools, planning and optimization, cleantech, and partnerships related to education and business drivers. Manufacturers are concerned about utilizing materials and resources in the most effective and productive way. Dave described the holistic view of manufacturing and stated that focusing on any one of the areas discovers different and compelling reasons to ‘green’ the process while maintaining the requirements of a design process. Engineers are challenged with making these decisions. Dave explained some of the reasons why industry should pay attention to the role of sustainability in manufacturing. For example, pressure from government or customers, competitiveness, efforts of continuous improvement and supply chain effects. By providing students with an understanding of LCA they are able to understand the links between one lifecycle stage and the impacts of others. An objective of LMAS is to enable students to leverage manufacturing for overall improvements across the lifecycle of a product. The fundamental concept is connecting manufacturing process parameters to part features and to part function. Margot Hutchins, Research Engineer & Lecturer joined UC Berkeley in 2011 as a Postdoctoral Fellow and is now the Associate Director for LMAS. She has worked with The Sustainability Consortium, NIST, and the California Air Resources Board on projects related to sustainability. 3) Bring sustainability into the professional practice of design and manufacturing. Margot provided an overview of the three different ways in which Sustainable Minds is currently integrated into this course. Use Case #1, Homework assignment – as part of this assignment, students choose a simple product and used Sustainable Minds to analyze its environmental impacts and propose two design alternatives. The focus is to understand lifecycle thinking and identify opportunities to reduce the impacts associated with the design. Within ten days, students were able to go from having no prior experience with Sustainable Minds to using it as a baseline for a report. As a result, students had a better understanding of how design decisions are linked to impacts. Use Case #2, Semester-long project – In teams of 3 – 5, students spend part of the semester working on a project with relevance to sustainable manufacturing. This project includes a consideration of the triple bottom line and an examination of lifecycle impacts. In one project, students used Sustainable Minds to examine the environmental performance of a soccer ball by comparing a standard soccer ball, a Senda Fair Trade ball and Soccket. Students recognized that there are different tradeoffs for each soccer ball that affect its triple bottom line. Use Case #3, M.Eng. capstone project – The Masters of Engineering Program, which focuses on developing leadership and technology expertise in students, requires students to participate in a two-semester long capstone project. Margot presented one project in which students improved the triple bottom line related to material selection of a turbine blade and used Sustainable Minds in assessing the environmental performance. Cindy Bayley, M.S. 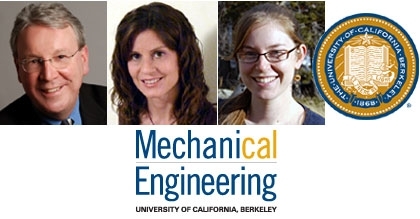 Candidate in Mechanical Engineering at UC Berkeley, is a Graduate Student Researcher in LMAS and summer intern with Sustainable Minds. Cindy presented her ideas for a next iteration project using Sustainable Minds for ME 290I: Sustainable Manufacturing. In this assignment, students will complete a series of weekly assignments with varying levels of complexity and takeaways for sustainable manufacturing. It also includes an exercise for better understanding of choosing a functional unit. She encouraged educators and students to explore the Sustainable Minds Learning Center where there is a section with examples of appropriate functional units for different types of products. Cindy described another new project to be integrated into the course module ‘Materials in Manufacturing’ in which students use Sustainable Minds to model a telescopic slide to learn where in the lifecycle the greatest impacts occur and what’s causing them. Students are given the information to model the telescopic slide using different materials and manufacturing processes. The goal is to teach how to create proxy data and to understand tradeoffs. She demonstrated an example of creating a proxy for industrial grease where a formulation was modeled using the raw materials. Some additional projects types to consider are: benchmarking two market competitors by conducting a product teardown, a classic comparative problem (paper vs. plastic bags, bottles vs. cans), and analyzing a product that students designed & manufactured themselves. Incorporating sustainability into manufacturing requires the use of measurement to characterize and understand manufacturing systems fully. Properly incorporating sustainability into manufacturing will provide new opportunities for optimization and improvement. Data-driven tools are needed to implement these solutions in manufacturing. When preparing students for industry, sustainability, like ethics, needs to be integrated throughout the curriculum. Companies are increasingly interested in hiring students with lifecycle assessment knowledge and experience. The range of types of curriculum described in this webcast demonstrate the broad applicability of Sustainable Minds and its influence in teaching lifecycle thinking in sustainable manufacturing in a hands-on way, in graduate to professional degree programs. Watch for more webcasts in this series, where we showcase more educators learning new things, building on what they know and getting started teaching in new ways. Sustainable Minds Curriculum Library: Sustainable Minds has example courses and projects from faculty teaching with Sustainable Minds. They are available for your review and use. If you’d like to learn about our Education Programs including class, department or unlimited subscription packages; curriculum, training and support, contact us at (617) 401-2269 or sales@sustainableminds.com.